In early December, the Association for the Protection of Ménez, Quelec’h and Saint-Gildas won a groundbreaking court case in France, in which the Court of Appeals of Renne ordered that eight wind turbines in Cast and Châteaulin be shut down from 10pm to 7am. The Association had sought court relief from night time noise disturbance in the area around the wind farm. News coverage is spotty: here is a brief summary of the case, and here is a French news story, crudely translated by Google. 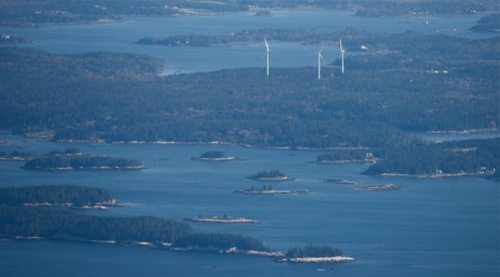 It’s a beautiful idea, come to fruition: in the island communities of Vinalhaven and North Haven, Maine, a local electrical co-op joined forces with a regional nonprofit organization, and built three large wind turbines which would provide the 2,000 households on the island with locally-produced power. On a lovely fall day in November, the largest group of island residents ever gathered in one place celebrated the commissioning of the Fox Islands Wind Project. But for some residents, the moment they had been waiting for had an unexpected element: clearly audible noise. Once again, the experience of people on the ground, and initial recordings and conversations with neighbors, suggests that the noise is most troublesome within a half mile of the turbines, with some lesser effects out to a mile or more. According to Fox Islands Wind, “it does not appear that, except in a few individual spots, there is much impact beyond a half mile from the site.” Wylie’s conversations and recordings suggest to her that “households within a mile to a mile-and-a-half radius of the turbines are impacted by the sound.” The commentary here at AEInews is beginning to sound like a broken record, but here we go again: it is clear that we will need to make some social choices about the degree of disturbance we are willing to trade for the benefits of renewable wind energy. There is little doubt that homes within a half mile of turbines often experience elevated noise levels, and beyond that distance, impacts diminish in frequency and severity. Where will we decide to draw the line? Island Institute community energy web info, including article on offshore wind and column in Working Waterfront on the genesis of the Fox Islands Wind project, including its economic justice/equity goals. The authors of the new AWEA/CanWEA report acknowledge that some people may be annoyed by the sounds of wind turbines, but stress that annoyance is not an “adverse health effect.” They also seem intent on assuring that any mention of annoyance rates is kept to 10% or below, which necessitates some creative re-interpretation of one of their key sources, a recent paper by Eja Pederson that compiled results from three surveys near wind farms in Scandinavia, summarized in October by AEI. In particular, they combine results from two studies in rural areas and one in a suburban area, which Pederson explicitly presented separately, because they illustrate that annoyance rates are far higher in rural areas (since the suburban study had more participants, the overall average is dominated by the suburban results). In AEI’s view (as regular readers will know), the bottom line in all annoyance studies is that while many (or even most) people who are within earshot of wind turbines are not strongly affected by the noise, a substantial minority (ranging from 5-40% depending on how close they live) are negatively impacted, sometimes to the point of abandoning their homes; our challenge is to decide how many people we feel OK disrupting, and regulating wind farm siting to match that choice. A study by a retired NY State Department of Environment staffer has found that in one community where two new wind farms are planned, “worst case” atmospheric conditions can occur up to 30% of nights in summer and fall, peaking at over 40% of nights in early summer. The wind farms in Cape Vincent are moving forward in the permitting process based on noise modeling submitted by the wind developers, which predicts minimal impact on neighbors thanks to an average background ambient noise level of 45dB. This study found that on nights with little wind at ground level, actual ambient sound in this rural area is generally below 35dB, and in many areas, drops to 25dB or lower for much of the night. Also, and most importantly, the study used standard predictive measures (including wind differential at two near-ground heights, daytime solar radiation, and night time cloud cover) to estimate how often the winds at turbine hub height would be high enough to turn the turbines on, even as the wind at ground level remained low – the situation that often triggers the worst night time noise complaints near wind farms. The sobering result was that such nights, which create noise issues for neighbors far beyond those predicted by the simpler noise modeling used during permitting, could be a regular occurrence for most of the summer and fall. After taking noise measurements at a wind farm currently operating in a nearby town – which found levels similar to those predicted and allowed in current Cape Vincent planning – the author notes that the vast majority of Cape Vincent homes will be close enough to hear the turbines easily on these “worst case” nights, with a third of local households likely to experience objectionable noise levels. It is important to note that these levels of audibility and possibly objectionable sleep disruption will still occur on a minority of nights; indeed, on an annual basis, only around 15% of nights. And, on those nights, just a portion of the population (those closest to the turbines) will be affected. This perspective is part of what has led to our current acceptance of relatively small setbacks from homes (often 1000-1500 feet). Our social decisions about wind farm siting will need to grapple with the question of how much disturbance we consider acceptable – in this case, a third to half of the residents of Cape Vincent may be looking at troubling noise levels for a third to half of summer and autumn nights. To protect most residents from most of the noise intrusions (by keeping noise levels to 5-10dB above the true local ambient level) would require setbacks of 1km or so (between a half and three-quarters of a mile), which would likely limit the Cape Vincent area to more like 30-50 turbines, rather than the planned 200. Wade, Whitehead, Weilgart. Conflict of interest in research on anthropogenic noise and marine mammals: Does funding bias conclusions? Marine Policy 34 (2010) 320-327. In the United States, the US Navy funds about 70% of the research into the effects of ocean noise on wildlife (and half, worldwide). For many years, conservation groups have questioned whether this preponderance of funding is skewing research results, whether by constraining the types of questions being studied, or by leading researchers to downplay negative impacts of noise in order to continue receiving funding. The authors of this new study report a significant correlation between Navy funding and results reporting “no effect” of noise, based on their analysis of several wide-ranging reviews of ocean noise science, and of the primary research papers cited in these reviews. While the data behind their conclusion is clearly explained, the results don’t look nearly as clear-cut to me; I question the comparability of the five reviews used, and while the trends in primary papers is more obvious, it’s hard to ignore the fact that the majority of military-funded papers still found that noise had effects. Indeed, as the authors make clear, it’s the conservation-funded reviews and primary research that is most clearly one-sided in its results (though there are good reasons for this, also fleshed out by the authors and in AEI’s commentary below). In AEI’s view, studies like this – and indeed, reviews such as those considered here – are diligent exercises in quantifying an issue that has become, for all practical purposes, an exercise in divergent world views and beliefs talking at and past each other. This post includes more analysis and interpretation by AEI than we generally include in our science summaries; it’s a long read, but the issues that triggered this study are important ones. Though the clear-cut results reported here are difficult to take at face value, it is well worth considering the underlying forces that drive tensions between environmental groups and Navy/industry actions in the seas. While primary research and even literature reviews funded by the military don’t appear overly biased toward finding no effect (since in both cases, they include far more results showing effects than not), it remains that in practical terms, the EIS’s generated by the Navy and the mitigation measures imposed by regulators on both military and oil and gas activities are largely grounded in the belief – and regulatory determination – that any effects of these activities are “negligible,” to use the formal term. Thus the focus of the conservation community on funding research and publishing overviews that emphasize credible studies outlining observed negative effects is understandable. Of special note is that the authors did not find any strong trend toward bias of results reported by independent, academic researchers receiving Navy funding for research studies – these studies showed a similar proportion of effect and no effect results as studies funded by neither the military nor conservation groups (though when comparing military-funded studies with all the others, including consevation-funded, a non-statisticially significant trend of 1.64 times more “no effect” findings was observed). This should diffuse widespread concerns that cash-strapped academic researchers are “cooking the books” or avoiding publishing negative findings in order to retain Navy funding (though it is perhaps unsurprising to note that few if any key Navy-funded scientists are among the researchers who are willing to speak out publicly to push for stronger regulations on ocean noise). The authors conclude that “much of the bias in military-funded research was in work carried out at military institutions, rather than in studies funded by the military but carried out at universities and other institutions.” Thus, research coming directly out of military offices is likely to remain less reliable as representing “the whole picture,” as may research entirely funded by conservation groups. Still, by integrating and considering the full range of studies reported in all of these reviews, the public can get a pretty decent picture of current state of our understanding of the effects of ocean noise. Of note, though, is that the proportion of “no effect” to “effect” findings is slightly lower in military-funded studies. In addition, military-funded studies are three times as likely to report BOTH effects and lack of effects in a single paper; this could indicate either a more careful assessment of the margins where effects are just noticeable, or a tendency to split the difference in order to either underplay the effects or accentuate the non-effects to assuage funders. While ocean noise issues came to public awareness after a series of stranding deaths and lawsuits, the fact is that deaths and injuries caused by noise are very rare. Even the leading environmental activists have shifted their focus, and today nearly all of the controversy over military and oil and gas noise boils down to differing interpretations of how important moderate behavioral changes are, and whether they should be avoided or not. And science is nearly incapable of shedding any definitive light on how important behavioral changes are, thus leaving the two sides largely reliant on their divergent faith: the Navy and oil industry’s faith that the behavioral changes are transient and negligible, and environmentalists’ faith that chronic behavioral disruption by human noise is bound to have negative consequences. Meanwhile, ethical questions about humanity’s relationship to the natural world are outside the bounds of discussion on one side, and central to the whole discussion on the other. This is not as black and white a picture as either side may paint, but it’s where we are. For AEI’s full summary and discussion of this important new study, dive in below the fold…..
Tougaard, Henriksen, Miller. Underwater noise from three types of offshore wind turbines: Estimation of impact zones for harbor porpoises and harbor seals. J. Acoust. Soc. Am. 125 (6), June 2009. 3766-3773. Underwater noise was recorded from three different types of wind turbines in Denmark and Sweden. The authors note that virtually all airborne noise from the turbine blades is reflected off the surface of the water, while vibrations from the machinery are transmitted through the tower and into the foundation, from where it radiates out into the water column and seabed. In general, turbine noise was only measurable above ambient noise at frequencies below 500Hz, with total SPLs of 109-127db re 1uPa rms, measured at 14-20m from the turbines’ foundations. By comparing measured sound levels with audiograms of harbor seals and harbor porpoises, the researchers determined that the sounds were only slightly audible for the porpoises at ranges of 20-70m, whereas harbor seals may hear the sounds at ranges of 100m to several kilometers. As a bottom line, researchers suggest that behavioral changes are very unlikely in harbor porpoises except at very close ranges, while seals may have some behavioral reaction out to a few hundred meters. For both species, masking is predicted here to be low to non-existent (due to differences between vocalization frequency patterns and the predominantly low-frequency turbine noise), and the sound is not loud enough to cause physical injury, no matter how close the animals are. As I look closely at the result, it seems likely that the apparent trend toward some property value effect largely mirrors surveys of residents near wind farms. The “problem” in interpreting this data and the surveys is that there is NOT a universal increase in annoyance or sleeplessness or dropping property values as you move closer to turbines; rather, there is an increasing MINORITY of neighbors who are negatively impacted. Several earlier posts address this factor: from 10% of neighbors at around a mile or so, increasing to 25% or so at a half mile, and perhaps 40% at a quarter mile, survey results reflect the well-known individual variability in susceptibility to noise. It seems clear that the “small and infrequent” numbers of homes negatively affected in the study addressed here, are mostly concentrated near turbines, and may represent a similar percentage of landowners as report sleep disturbance and other noise impacts. If so, the 5% average price hit is apt to represent a much larger valuation drop in a quarter or so of the homes that are within a mile. NOAA has released its proposed critical habitat for the endangered Cooks Inlet beluga population: it includes the entire upper part of the inlet (which includes Anchorage and Wasilla), and a coastal stretch of the lower part of the inlet as well. This isolated population of belugas experienced a population crash in the 1980’s which is widely blamed on over-harvesting by native subsistence hunters, but has not recovered since the hunting was limited. Pollution, limited salmon runs, and noise are all considered likely factors in the population’s struggle to survive. Over the past few years, it has become apparent from field research studies and monitoring around seismic surveys that belugas are among the more sensitive cetacean species to sound; they tend to avoid noise sources at greater distances than most other whales, often tens of kilometers. According to the Anchorage Daily News, NOAA officials said the proposed rule and the prior listing of belugas could trigger some changes to major development projects over the next decade — seismic drilling for offshore oil and gas, and a dock for the Chuitna coal strip-mine proposed on the west side of Cook Inlet, for example, the agency said. NOAA said it doesn’t anticipate the stepped-up scrutiny will result in rejection of energy projects in the Inlet. The rule would require other federal agencies to consult with the federal fisheries service before approving projects in the proposed critical habitat areas. Ongoing construction at the Port of Anchorage, planned to continue for several more years, includes monitoring for belugas that may be close enough to be seriously disturbed, though the Port Director said they will be submitting comments on the proposed designation. UPDATE: Public comments on the critical habitat designation have been extended to March 2010. A NOAA biologist assured locals attending a public meeting that the new designation would not add “onerous” oversight. Dixmont’s farming heritage is reflected in its forests and open fields, but the town has become a rural bedroom community for Bangor, Newport and Waterville. There are few local businesses; the elementary school is the largest employer. So when developers began measuring wind speeds atop Mount Harris, Hog Hill and Peaked Mountain, some residents saw the chance to lower taxes through revenue collected from renewable energy. Others, however, saw their town with no protection from industrial development. That led to a moratorium on wind projects last November, while the town crafted rules. What followed was a deliberate process in which the Planning Board studied wind power ordinances in other states and countries, as well as Maine’s model ordinance. The town encouraged residents to make the half-hour drive to Freedom, where they could stand under the whirling blades on Beaver Ridge. Some residents even visited the wind farm at Mars Hill in Aroostook County. Several townspeople spoke to homeowners next to these projects. Among the messages they heard is that the turbines disrupted abutters’ lives. Complaints ranged from noise and visual flicker to health effects that some people blame on living near wind farms. These anecdotes seemed to have a decisive impact, said First Selectman Judy Dann. “I think people listened to the stories that these people had to tell,” she said, and helped convince a majority that wind turbines weren’t a good fit for Dixmont. Meanwhile, the selectmen in Jackson unveiled a 56-page draft ordinance that includes several unusually far-reaching elements. Setbacks are proposed to be 13 times turbine height, which would come to just under a mile for 400-foot turbines; current industry norms are closer to 300 feet, which would create setbacks of about three-quarters of a mile (likely to avoid nearly all noise complaints, based on recent reports of problems at other wind farms, and several larger research studies of annoyance and sleep disruption around wind farms). This would require energy companies to negotiate with all families in that large zone if they wanted to obtain waivers, which would also be allowed. The Jackson ordinance will be put to a local vote after the selectmen consider it more fully. Meanwhile, the Friends of Lincoln Lakes filed a legal brief supporting their appeal of the August decision of the Board of Environmental Protection (BEP). At that time, the BEP affirmed the April 2009 Order of the Department of Environmental Protection, granting a license to First Wind for the construction of the Rollins Ridge Industrial Wind Farm in Lincoln and surrounding towns. The brief questions the adequacy of the noise standards as well as the modeling used to assure compliance with the noise standards. Download full brief here. In Dufferin County, Ontario, the Orangeville Banner recently ran a very well-written and balanced three-part series on that region’s ongoing controversies over noise from wind farms. The piece makes very clear both the extent of noise-related disruption felt by some residents (including the first official acknowledgement I’ve seen that the wind farm developer did indeed buy out at least two nearby neighbors who could not adapt to the turbines’ presence), and the larger context that is also a consistent feature of the issue: that the majority of neighbors are not having any particular troubles with the turbines and their noise. The 133-turbine Melancthon EcoPower Centre has spurred recurring noise problems for 17 households, out of 300 that the company calls “neighbors.” It is not clear whether those bothered are concentrated closer to turbines, or how far from the wind farm households are being included in the 300 number.